hart + sew | Vintage Baby Clothing: hairblooms giveaway winner! 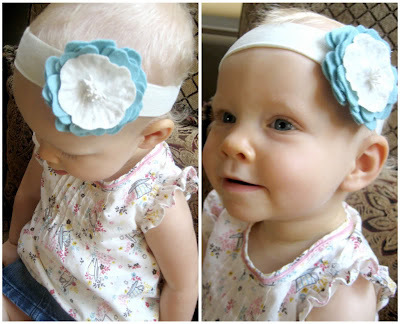 The little miss rocked her hairblooms hibiscus headband this weekend and it was so cute on her now I want one too! You can ask for them to come as clips so even us grown-ups can wear them! Thank you to everyone who commented and linked to the hairblooms giveaway! My sister is so appreciative of your support; her shop has taken off already and a big part of that was you helping to spread the word! Thank you, thank you! **For those of you who didn't win, don't fret - you still get something too! Shelly has offered free shipping to the rest of you, just mention "giveaway" in the message to seller box when you order! Offer expires Sunday, Sept. 6th. WOO HOO!!!! I have never won anything before!!! Thanks! !